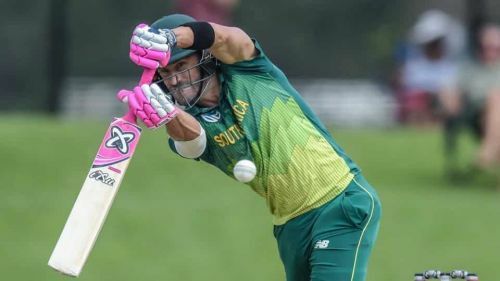 South Africa sealed the 5-match ODI series with a crushing 71 runs win via D/L method in the 3rd ODI played at Kingsmead, Durban on Sunday, against Sri Lanka. Thanks to Quinton de Kock's century and contributions from the other batsmen, the hosts posted a big total. With the help of D/L method, Sri Lanka could not chase the revised target. Sri Lankan captain Lasith Malinga won the toss and decided to field first. Quinton de Kock continued his superb form in this series. Isuru Udana struck by dismissing Reeza Hendricks for 4 runs. Captain Faf du Plessis and de Kock played with attacking approach. At the end of 10 overs, South Africa were 58 for 1. De Kock reached his fifty off 49 balls. Faf du Plessis scored a quick fire 36 off 27 balls. De Kock and Faf du Plessis added 97 runs for the 2nd wicket. De Kock continued to play in his natural approach to reach his century off 89 balls. De Kock was dismissed for a brilliant 121 off 108 balls. De Kock and van Dussen added 63 runs for the 3rd wicket. Van Dussen steadied the innings with 50 off 66 balls and was dismissed after scoring 50. David Miller and Pretorius added 53 runs for the 5th wicket. Pretorius scored 31 off 26 balls. Miller 41 and Phehlukwayo 38 off 15 balls helped South Africa post a massive total of 331 for 5. Chasing the target of 332 runs to win, Sri Lanka lost two early wickets of Dickwella and Fernando. Sri Lanka were 75 for 2 at 16 overs when rain arrived. With a revised target of 193 runs in 24 balls, the visitors scored 121 for 5 in 24 overs. South Africa won the match by 71 runs via D/L method. South Africa 331 for 5 in 50 overs (Quinton de Kock 121, Van dussen 50, Phehulkawyo 38*, Miller 41*, Udana 2/50) beat South Africa 121 for 5 in 24 overs( Kusal Mendis 41, Fernando 25, Imran Tahir 2/19) by 71 runs via D/L method.